Fellow role-players, here is my update for Session T3.40 of the latest adventuring party in my “Vanished Lands” heroic fantasy campaign setting. The teleconferencing team met on Sunday, 29 January 2012, and has been using Pathfinder, Skype, and an online dice roller. 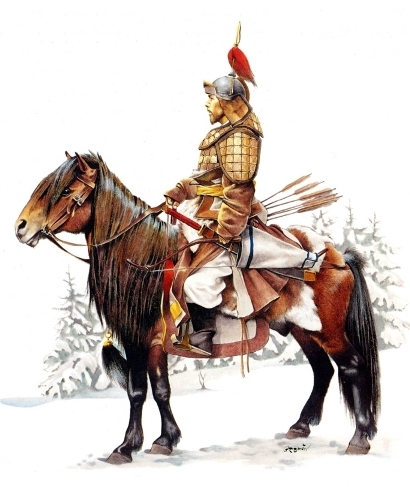 >>”15 to 16 November 1229 B.C.E. 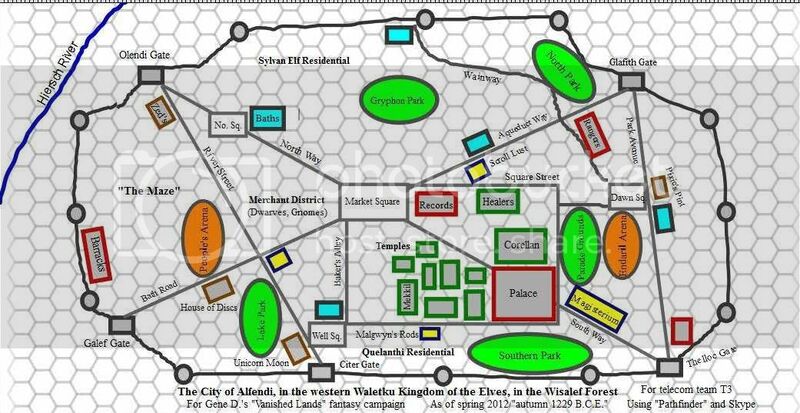 :” After recovering from their long journey across the Plains of Sathendo, the travelers continued exploring the city of Alfendi in the Waletku kingdom of the Elves. Early one morning, Asish and Jovinda pass archers practicing outside Alfendi’s high walls and walk into the surrounding woods. They find a clearing, mark the four cardinal directions, and burn incense. The Tsucharim Ranger bonds with his dog Genghis, as the Half-Elf Cleric invokes nature goddesses Mekkil and Ami-Koshi. Jovinda cuts Asish and nervous Genghis with a ritual dagger and mingles their blood, smears their foreheads with ash, and declares them brothers. Meanwhile, Kazuo and Hateem stretch and do morning katas in Lake Park, near the “Unicorn Moon” inn. Neither expects to find trainers for their exotic fighting styles at the local arenas. The Nezumi Monk and Suthern Dervish then go to the main market square to find warmer clothes and a small drum for Hateem. Asish goes for a run with Genghis to hone their communications, and Jovinda wanders alone to search for an animal companion. Hiking to a rocky ledge over a fast, cold stream, the priestess sees a large falcon preening in the the sun. The bird of prey has glossy feathers and an unflinching gaze. Kazuo and Hateem meet up with Asish, Jovinda, and their animal companions. Genghis has little use for Sun Wing, who doesn’t mind the bustle of the city because it offers much prey. Jovinda allows the falcon to hunt after warning him to avoid carrier pigeons, whose masters might get upset. At the “Pixie’s Pint” tavern, the adventuring party listens to a Dwarf skald’s bawdy songs while waiting to meet Aldarion, a Grey Elf Ranger whom Asish had contacted. The group sits at a back table and orders food and drink. Hateem joins in playing music with Durgin Blackbrow. Aldarion arrives and explains that he has sent word to King Ereval I [Steve A.L./Non-Player Character] about the threat of Vappu Lahja’s followers. The onetime general also says that the Elven Rangers are monitoring the troop movements of the Drow of Zuromm and the Nannuattan of Gokuri. Jovinda and Asish are concerned about rumors that the Grugach tribes have been swayed by Gokuri guile or infiltrated by disgused Ninjas. A woman wearing a hooded cloak enters the tavern and quietly approaches the “Uncommon Companions.” Asish recognizes her white hair, pointed ears and teeth, and violet eyes as that of a Dark Elf, and he draws his katana. Kazuo and Hateem ready for a fight but hold and wait. Jovinda‘s suspicion that the newcomer is “Thalissa” [John Z.G./N.P.C. ], Aldarion’s wife, is confirmed when the Ranger greets her warmly. Asish and Kazuo relax only slightly, and Hateem observes that the ebon-skinned Elf reminds him of certain desert spirits. Thalissa confirms that the jade chop that Asish retrieved from his former overlords is an order for Gokuri troops to mass. The alluring “Jade ‘Xi’ Aschent” [Sammy/N.P.C.] had translated it previously. Thalissa also notes that there is a coded message hidden in the pictograph indicating an order of assassination, not uncommon among the Nannuattan. Jovinda asks how imminent the danger is to the Waletku kingdom, and Thalissa responds that since Asish took the chop when he escaped the Calastrial clan, the orders probably weren’t received or implemented for months. The Tsucharim rider reluctantly asks the Nannuattan exile for training so that he can eventually free his family. Thalissa agrees to help, showing him “whippets” (incendiary boomerangs) and mentioning her son in law, “Shea” [Peter D./N.P.C.] in the Ivory Mountains to the northwest. Aldarion says that Alfendi’s Rangers would pay for any new maps, especially of areas beyond the Wisalef Forest. Back in the main market square, Asish goes to Sylvan Elf tanner Gadrelas on River Street to arrange for leather bracers for new falconer Jovinda. The scouts also buy arrows from bowyer/fletcher Hasariel near the North Park and visit Mountain Dwarf armorer Ygnis Miklovitch. At the smithy of Glosin, who silvered Asish’s katana, Hateem asks about weapons that might be useful against Unseelie Fey. The Hill Dwarf replies that a reddish alloy known as “cold steel” is effective against all magical creatures. In addition, they plan to visit the shop of Gnome alchemist Rapalikvarbingisparrow… (“Rapalik” for short) for some potions. Jovinda buys food from Faldine Halfling Miranda Northshire, who recalls meeting Digger several weeks ago [in “game time”]. Jovinda and Kazuo follow tea merchant Bodhi Chandarev’s directions to the tea house of Bamboo Spirit Folk (eastern Sylvan Elf) Seng Shiu Jun. Asish has a date with Jade, but the rest of the “Uncommon Companions” don’t want him to go alone…. Thanks again for your patience as we deal with balky technology and another upcoming interruption to our schedule as Josh & Sara and Janice and I move. Note that our next telecom fantasy game will be on Saturday, 4 February 2012, to accommodate the Super Bowl. Posted on February 3, 2012 by GeneD5Posted in Fantasy & Steampunk, Games, Vanished LandsTagged pathfinder, rpg, skype, telecom team.